Share the post "Album review: STEVE HACKETT – At The Edge Of Light"
I mentioned in my 2015 GRTR! review of Steve Hackett’s ‘Wolflight’ album how his star has been in the ascendency as a result of his wonderful live shows showcasing the Genesis back catalogue. Such has been the success of this venture, it seems to have re-ignited and enhanced his creative and playing skills, as both the aforementioned ‘Wolflight’ and the subsequent ‘The Night Siren’ were a real step-up in quality from previous recent outings. 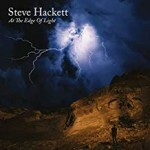 ‘At The Edge Of Light’ is Hackett’s twenty sixth studio album (!) about which the pre-release publicity emphasises Steve’s world music preferences. Surely this wasn’t to be Hackett’s ‘Graceland’ moment? I think most fans will regard this as the album Steve Hackett always threatened to make. It’s as if he’s distilled every high point from previous albums, infused them with a variety of sounds from around the world and topped it off with some of his finest ever guitar work – to stunning effect. Eighteen months in gestation, the album is a reflection of Steve’s world view in all its wonder and horror and features all the usual suspects – Roger King (keys, etc. ), Jonas Reingold (bass), Gary O’Toole (drums), Rob Townsend (saxes, clarinet, etc.) and brother John on flute – but also the likes of Nick D’Virgilio (drums), Sheema Mukherjee (sitar), Malik Mansurov (tar) and sister-in-law Amanda Lehmann (vocals). Musicians’ musicians every one of them. The world music shows its hand in opener ‘Fallen Walls And Pedestals’ with its middle eastern vibe and pounding drums a great counterpoint to ‘that’ guitar. ‘Beasts In Our Time’ has one of those pastoral acoustic openings that Hackett does so well only to segué into an anthemic orchestral riff which has a distinct King Crimson ‘Epitaph’ vibe and electric soloing of the highest order – prog with all its ducks in a row. For me, the zenith of this album comes on the eleven minutes of Hackett heaven of ‘Those Golden Wings’, which constantly shifts between gentle, orchestral backed vocals to a real ear-worm of a riff, to a Carmina Burana-esque choral section to be finally resolved with a three minute guitar solo which, and I’m going to be controversial here, tops ‘Firth Of Fifth’. There, I’ve said it. Absolutely gob-smacking. North African rhythms and an Indian flavour dominate ‘Shadow And Flame’ and Hackett allows us to draw breath with the light relief of ‘Hungry Years’ before the malevolent triptych of war and peace ‘Descent’ (think Holst’s ‘Mars, The Bringer Of War’), ‘Conflict’ and ‘Peace’ bring the album to a close. In his long and distinguished career at the forefront of everything that’s good about progressive rock, Steve Hackett has consistently delivered albums of the highest calibre in a genre blessed with the finest musicians. With ‘At The Edge Of Light’ he’s taken even his exceptional abilities to another level. This entry was posted in ALBUM REVIEWS, ALBUM REVIEWS (Mobile), All Posts and tagged album, At The Edge Of Light, Flower Kings, Gary O'Toole, John Hackett, Jonas Reingold, Nick D’Virgilio, prog, Progressive Rock, review, Rob Townsend, Roger King, Steve Hackett. Bookmark the permalink.